Even more personal with your own lovely Monogram at the top! Or if you prefer you may choose the scroll design in place of the monogram. The petite size is ideal for smaller wall areas or door applications. The one line holds up to five 1.5" characters. The sign is 8.25" x 5" in size. The Standard Plaque is perfectly suited for the average home! In addition to the wall mount it is also available as a lawn mount that comes with two 18" lawn stakes. The One line version holds up to five 3" characters or twelve 1.25" characters. The two line version, line one holds up to five 3 inch characters and line two twelve 1.25" characters or line one can hold twelve 1.25" characters and line two five 3" characters. The plaque size is 10.75" x 11.75". 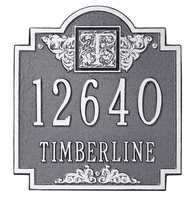 Estate Plaques are proportioned for larger homes and increased visibility across expansive yards. In addition to wall mount, this plaque also comes with a lawn mounting option - two 18" lawn stakes. The one line version holds up to five 4.5" numbers or seventeen 2" characters. The two line version, line one holds up to five 4.5" numbers and line two holds up to seventeen 2" characters or reversed line one hold up to seventeen 2" characters and line two holds up to five 4.5" numbers. The plaque is 23.25" x 12.25".